The evening before and morning of the competition were relatively stress-free for me. Despite the pressure that I’d put on myself to perform I knew I’d make weight, I knew I’d done as much preparation as I could and I was in good company. The morning of the competition came and we arrived literally about a minute after I’d been called for weigh-in so I had to wait around for half an hour before I could be weighed in, which was not too bad as I’d been able to drink a little, but I did start to get quite hungry! Although I didn’t feel nervous in myself, I did notice that I was a little shaky and breathing a little more quickly than normal so I tried my best to calm myself down. I weighed in at 51.55kg, the lightest I’ve ever been, and sat down for a short while to refuel and rehydrate. Warm up for squats went entirely to plan, just hitting depth on my last warm-up of 110kg. Again, I didn’t necessarily feel nervous but I must have been quite nervous as I was sweating so much more than everyone else in the warm-up room! I hit my opener of 115kg with ease, though this was unfortunately my only good lift of the squats. My next lift of 122.5kg was not to the referees’ satisfaction depth-wise, and I rounded my back more than usual on the way up, tiring out my core. I re-took the same weight but it was again not deep enough. This upset me quite a lot, as hitting depth had been my main concern for squats, rather than having the strength to do the lifts. Although I had previously managed to hit 130kg in training doing my own wraps, I think I possibly didn’t have enough confidence in my own wrapping on the day of the competition as there was a lot of time pressure, and my hands had been shaking (leading to a small sliver of my finger being removed at some point during the wrapping process!). I have invested in some tougher wraps, and in future I will either hopefully have someone there with me to wrap, or have built on my own wrapping skills. I have kept the videos of my failed 122.5kg lifts, as in the next few weeks I really want to work on my squatting technique, and will be able to use them for comparison purposes. After a short break to gather my thoughts and calm down a bit, we moved onto bench warm-up. This went really well, as the warm-up weights felt light, particularly a 50kg paused raw press which is usually a bit of a struggle! My shirt went on and felt nice and tight, and I hit 60kg twice to prepare for my opener of 62.5kg. This went up nice and easy, so I went on to do 67.5kg for my next lift, beating my own British record (though this was not mentioned by the commentators despite my telling them). This also went up a treat, so after some consultation with my coach I went on to do 70kg for my next lift, as I knew I would definitely get it and wanted to beat my own record again! This was definitely the right choice of number as there was a little struggle on the way up, and any heavier might have made for a failed lift. Although I have done a little heavier in previous competitions, I am still happy with my bench performance as I managed to beat my own British record and somehow stay composed after being quite upset about my squats. I think it is time to move onto a slightly tighter bench shirt, as while my current shirt has served me well, I think I have possibly reached its limits. Warm-up for deadlifts were not as I had planned, but I had anticipated some difficulty after tiring out my core from the squats. After reaching 110kg in the warm-up room and finding it quite a challenge my coach and I made the decision to move my opener down to 115kg (we had previously planned 120kg). Although I knew this would make my coveted 130kg a little out of reach, based on how my body felt I knew it was the right decision. I got my opener easily enough, but knew my body positioning wasn’t quite right, so really concentrated on setting my scapula back for my second lift of 120kg. This went up with a little struggle near the top, so went for 125kg for my third lift as I was never realistically going to get 130kg. I think by this point I was just ready to stop so didn’t go into the lift with as much composure as normal, and got it half way up before failing. I didn’t mind though, as I had hit an equal comp PB for deadlift and had at least one good attempt for each lift. After my final deadlift I was completely drained, struggling to even put food in my mouth! I was glad the competition was over, and although a little disappointed with my performance, excited for the coming months of training having pinpointed lots of areas to work on. In the few hours after my last lift it was nice to sit with my family and watch the rest of the competition and have a much-needed catch-up session. In this time my coach informed me that along with my nomination for the Junior Worlds, I’ve also been nominated for the Western European championships, which is the following week! I’m not sure if I’ll be able to attend due to University commitments, but it is still very exciting news, especially as I have been nominated as a senior! 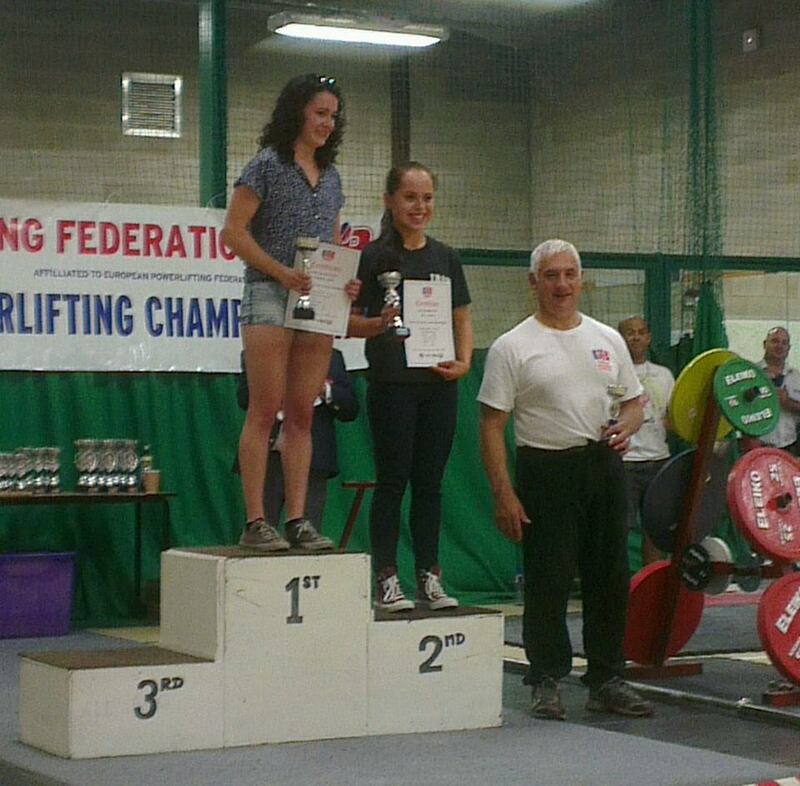 In the prize-giving I placed first in the Junior 52kg category, placing above a girl who lifted raw. She managed to achieve (and smash!) the records that I was hoping to set at the All England in August, so I have decided to do that competition equipped, to give me more experience and have another chance at some records! An experienced equipped lifter won the Senior category, and it was lovely to finally meet her as we had only ever spoken online. I have had the privilege of being handed down one of her old squat suits, which is tiny compared to my current suit, and I just can’t wait to use it! As ever with GBPF the competition was smoothly run, with fantastic referees, spotters and loaders making for a fantastic day. Now to get back in the gym and make some more gains! Despite having a great deadlift session on Friday, and achieving a set of 3 on my previous comp PB of 120kg, my lack of motivation from the previous week persisted throughout the weekend. A night out, work, and an exhausting trek around the new forest probably didn’t help, but Monday came about and I felt exhausted, overwhelmed and unmotivated. I made the decision to take the day off from work and training and just take some time to recuperate. I took a couple of naps, did some cooking, watched some mindless TV and just generally chilled out. On top of this I did some perusing about the internet to try and find some coping techniques for when you’re burning the candle at both ends, and struggling with motivation. My friend recently introduced me to TED talks, so listening to a few of those about motivation and happiness really helped, but most of all a couple of articles on Pat Reeves’ website, sent to me by my mother, really helped me feel more focused. An article about anxiety in lifting really helped, in that it reminded me to recall things I had previously used as coping methods, not necessarily just in lifting but in day to day life. Things like taking time out to just relax and listen to music, saying no to social events if I’m feeling swamped, and writing down everything I needed to do to de-clutter my mind. Next was an article about achieving goals which really helped me re-focus. My main goal at the moment is to be selected for Hungary, but unfortunately I don’t have a definite time-scale or much detail about this. So I worked with what I had and wrote down all the things I’d need to do to achieve this; stay consistent with my training, stay at 52kg, try and incorporate some assistance work and most importantly stay excited about this amazing opportunity. From this, I decided to update my goals board and turn it into a motivation/goals wall. I’m quite a visual person so hopefully having these reminders in a very prominent place will help me to stay focused, and get me to where I want to be. Taking the day off everything was definitely a good idea, as I had a great 12 hour sleep last night and woke up feeling more able to deal with current pressures. I’ve had a very productive yet enjoyable day today, and feel a bit more like myself. Training this evening was a bench session, although I did some light squatting to warm up. I worked raw up to 50kg then put my shirt on for 60kg, moving up in 5kg increments to 75kg. Through some fault of my weight, or the way my shirt was put on me, I wasn’t able to get the bar down to my chest, even at 75kg. Although a little disheartening, with not long until the British I’ve decided to go back into my old shirt and work with that. My numbers might not be as high as I’d like, but it’ll be more productive and rewarding training in the short time we have left before my next competition. I can only apologise for my lack of posts over the last few weeks; with the third term rapidly drawing to a close I’ve had to put a lot of my time and energy into my university work so haven’t been training as much as I would like and haven’t really had the time or motivation to post! With just under a week to go of my second year, hopefully I’ll be back to posting regularly soon. Competition prep for the GBPF South West Classic was a bit more relaxed than it had been for previous competitions. As it was a small friendly competition on home ground, and as I was lifting equipped as a guest it was more for experience and to show what I can achieve in kit. With my birthday two days before the competition it was a little frustrating to say the least to still be hovering on the edge of the 52kg class, and not be able to indulge in any celebratory food or drink on my actual birthday. I ended up having a really productive day in the library, and more than made up for it after the competition so no harm done! It was really great to have my family come down to visit, see me lift and most importantly to compete! My brave mum successfully competed in her first powerlifting competition after I very sneakily entered her without her knowledge. It was a bit of a gamble as to whether she would or not, but it’s something we’ve been talking about getting her to do for ages. Getting her out of her comfort zone and showing her how fun it can be was the aim, and I think I succeeded! The morning of the competition I weighed 52.0kg on my own scales, so decided to have a hot bath to cut a couple of hundred grams to be safe. I ended up going up to 52.1kg, whoops, so had to go about the rest of my morning wearing thermals and a woolly hat! Got to the venue and weighed in 52kg on the dot. I hadn’t really cut down food or drink the evening before so this was probably the reason for the near-mishap. A nice little break before squats was welcome, to refuel, rehydrate and talk my mum through how the day would go. I think having my mum there to look after, along with being in a familiar place, really helped my nerves, as I wasn’t nervous at all. Warm-up for squats went well, wearing my normal squat suit (a borrowed smaller suit didn’t work too well for me) I managed to hit parallel depth at 100kg, then actual depth at 110kg before going on to do 112.5kg for my opener. My suit was ever so slightly looser than normal but I had an absolutely brutal wrapper helping me out so the wraps helped more than the suit I think. My next lift of 120kg felt slightly tough and I rounded my back on the way up a little bit, but I got it up and that’s all that counts! I think I got one red light for depth, though. My next lift of 125kg was tough to walk out, but very comfortable to actually lift. As you can see in the video above it’s definitely not a maximum effort! But at 7.5kg more than my previous comp PB I can’t complain really. 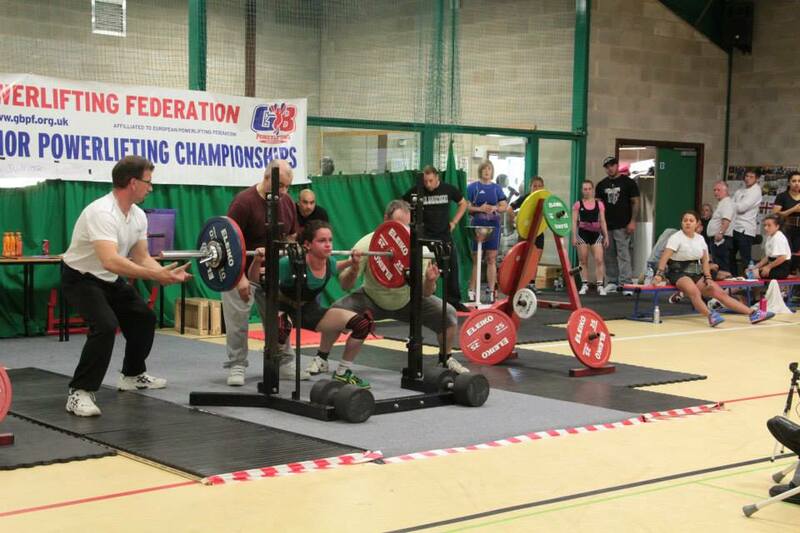 With all the stress of kit lifting, 3 good lifts and a comp PB was brilliant. Warm-up for bench also went well, managing to get up to 60kg easily. My pecs did feel tired for some reason while I was warming up but this didn’t seem to affect my lifting at all. With some slight confusion as to when the ladies would be starting, I ended up warming up a little early so had to do 60kg a few times before my opener of 62.5kg. My opener went well, but my technique was possibly not ideal. Still got the bar up! My next lift was 67.5kg and my form was a lot better. I already had my comp PB of 67.5kg so there was less pressure on me for my third lift of 72.5kg. But I went out, set up perfectly and got the lift! It was tough at the top, but I anticipated the ‘second hit’ and pushed through it. As this is a lift I had only done a few times before in training, and relied heavily on me getting my form right, it was a great feeling to get it in competition. Warm-up for deadlifts could have gone better, but with my results I don’t think it mattered too much. Again I had a little confusion as to when we would be starting so I think I had a little too much of a leisurely lunch, and ended up putting my deadlift suit on a little late. I was almost too relaxed about deadlifts, as with the lifts I had got so far I would only need to get my opener of 105kg to surpass my desired total of 300kg. But I think this might have helped, as there was a lot less pressure on me. I got my opener easily, and went on to 112.5kg for my second lift. As I had only got 110kg in my last competition I just wanted to surpass that and I would be happy. I didn’t straighten my back enough at the bottom of the lift so it took a little longer to lock out than I would have liked but I got it. 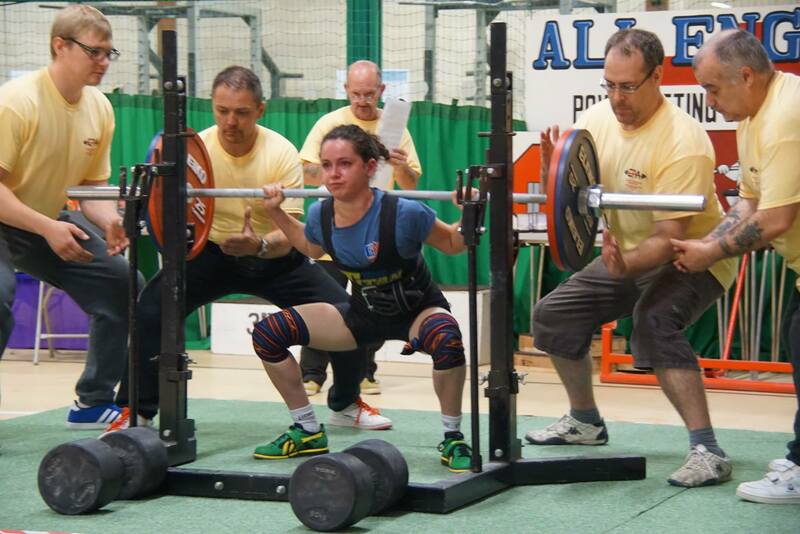 Next, after a little consultation with my coach I opted for 120kg for my third lift! I have only ever lifted 115kg, but wasn’t far off 117.5kg at my previous comp, so 120kg would be a big PB. As I was already past my desired total there was nothing to lose. I went out, I set up, I straightened my back and I got the lift, almost easily! Now the British standard of 130kg doesn’t seem that far off at all! I couldn’t have been happier with my final lift, to get a massive PB like that and get a 317.5kg total when I was only aiming for 300kg was just amazing. I think the relaxed and friendly atmosphere really helped me, along with the distraction of helping my mum. She got all white lights on all her lifts, which is a tremendous achievement for someone who doesn’t even train in a powerlifting gym, and has never properly been refereed! I’m very proud of her. A big thank you to my coach and all the lifters for supporting her and making her feel so welcome. After a short presentation, myself and my family headed out to a pub for a well-earned beer and burger in the sun. To have such a successful day of lifting and then to spend a lovely evening with my family really made for a great belated birthday celebration. My next competition won’t be until July, so I have had a few days off lifting this week. It’s time to start the cycle over again and make some raw strength gains before I get back into kit. I’m hoping to find some smaller kit to lift in, which should hopefully get my numbers up even higher. Exciting times ahead. Just need to get this uni year over and done with and I can properly concentrate on lifting again, as I’m just a little distracted at the moment! Although training this week has just been competition prep, which is normally not too taxing, it has been really tough for a number of reasons. Monday’s bench session was frustrating as while I’d had a really good bench session on Friday and even hit some PB’s, it just wasn’t working for me. I was struggling with weights around 60kg which I’m looking to open with. Apparently when lifting off my chest I was pushing slightly away from me, making the lift harder. Frustratingly I couldn’t feel what I was doing wrong, so didn’t know what to do to rectify it. The session left me feeling frustrated and under-prepared but I was happy with the knowledge that I still had Wednesday’s session to sort things. Tuesday’s session was final squat preparation. The fact that I’d recently washed my suit in a lot of sugar made it a lot harder to get down to depth than it had ever been before. I struggled with having the straps down, due to the tightness of the suit, so I had to put straps up before I normally would. I was seeing stars at mid-depth, and it felt like I was right down deep. Finally managed to get to depth with 115kg, it felt like I was literally folding myself in half to get down, but I got there. Coach was being very tough on me and not taking any excuses I had as to why I wasn’t getting to depth. It was a difficult session but I know it was for my own good. Worked up to 125kg and decided on 112.5kg as my opener, just to make sure I can hit depth. 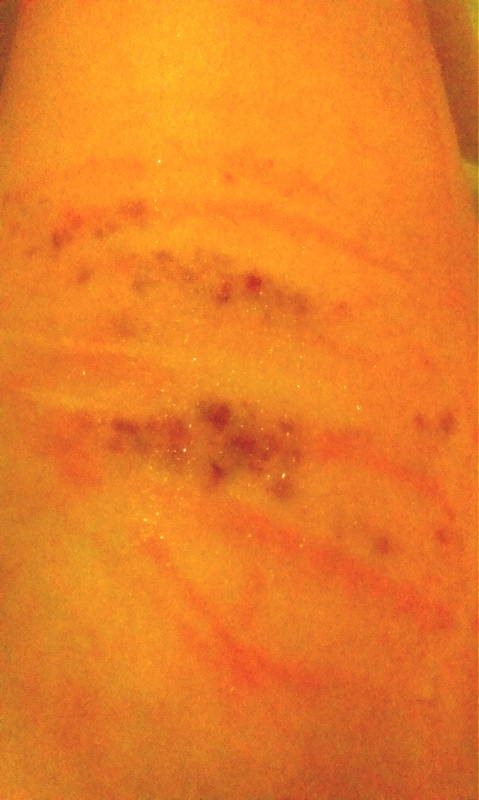 Got some pretty hefty bruises from the session, the picture below just doesn’t do them justice. Ended up with some speckled bruising up my face from the pressure too, which was new! With my squat suit being that tight, and having just washed it again, I’m slightly concerned how it will work for deadlift on the weekend, but we shall have to see. Bodyweight is fluctuating around 52.6kg at the moment, hoping I’ll be able to drop in during the next few days. Testing my true morning weight again tomorrow morning, so no food or drink for me at the moment. Not too bothered though as I’ll be going to bed pretty soon, getting up early for a work training day tomorrow. 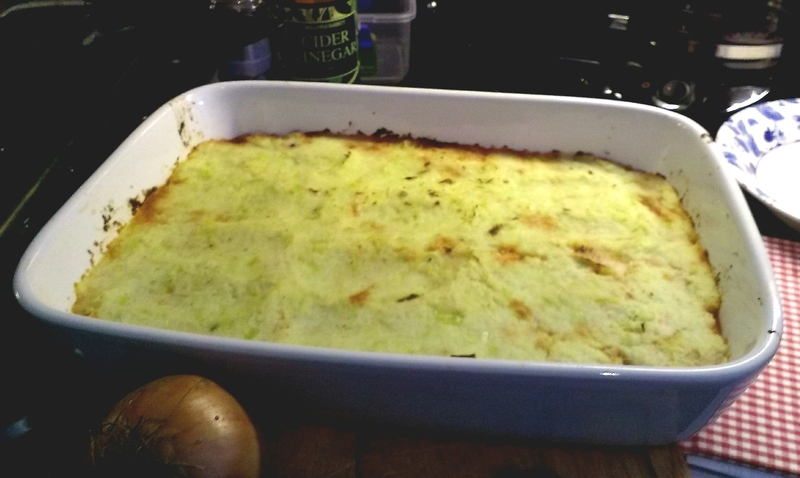 I’m hoping to have time to post another recipe tomorrow, watch this space! Easter Sunday: the bar has risen! With the competition one week away today, training was working on competition lift rehearsals and routine practice for squats; rolling, wrapping, squatting and unwrapping. Currently suffering from squat death right now for the first time in ages, so I apologise for any upcoming errors or nonsense. 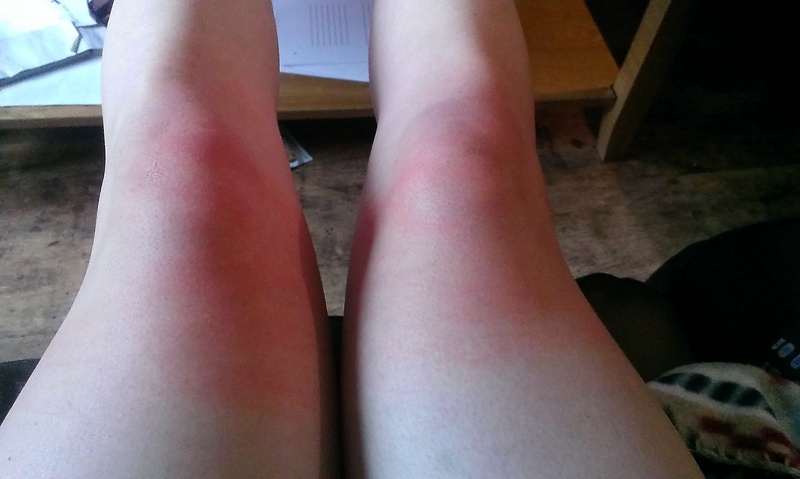 Warmed up to 70kg raw which felt a little tough, my thighs are still a little sore from the week’s work. Then put my newly crispy squat suit on, but with my weight on its way down it still felt a little too loose. Did 80kg and 90kg with suit bottom and no wraps and then 100kg with suit and loose wraps. With the suit still feeling a little loose, decided to turn it around which is how I’ve been tightening it for deadlifts. This seemed to work a treat as I did 100kg again and it seemed to be a little easier. Psychosomatic or not, it worked. Next squats were 107.5kg, 112.5kg and 117.5kg, with tight wraps. All quite easy but not quite to depth, and inch or so to go. For my next lifts I recruited an even tighter wrapper, for a PB attempt of 120kg. Managed this with ease but apparently only hit parallel, so kept on moving up! Starting to learn to relax into the pain of being wrapped, I’ve found plastering an angelic smile on my face does the trick.